The best specified of the book shelf range, Beovox S 45-2 was differentiated from the rest of the range by being a three way speaker. A 2.5cm Philips dome tweeter was fitted along with a 20cm Peerless woofer with a rubber roll edge of higher quality than Beovox S 35. There was also a heavily doped SEAS phase link unit mounted in a plastic canister supported by a heavy foam cushion. Text copyright © Beocentral. Unauthorised reproduction prohibited. The cabinet was of the same dimension in height as Beovox S 35 and width but was 3cm deeper. In addition the metal trim was fitted to both the back and front of the cabinet. The badging on the front designated the speaker as S 45 with only the type label on the back revealing the -2 status. There were pretapped sockets for the optional floor stands which were covered by removable black plastic discs. A single two pin Din plug was on the black vinyl covered rear. 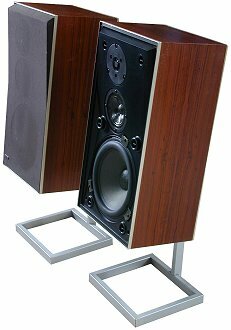 Similarly dimensioned cabinets were used for the later S 30 and S 40 speakers but these units lost the phase link driver, being only two way units. Text copyright © Beocentral. Unauthorised reproduction prohibited. Beovox S 45-2 was a very successful model of speaker and produced an exceptionally balanced performance. It was succeeded by Beovox S 55 and S 80 in the updated Uniphase range, though they were sold for a short time following the introduction of the new range. Text copyright © Beocentral. Unauthorised reproduction prohibited.